This Arca-Type Quick-Release Plate from Acratech is compatible with the Canon 7D and with most Arca-Swiss compatible release clamps. It's machined in the USA from 6061 T-6 aluminum and features an anti-twist lip that prevents rotation. 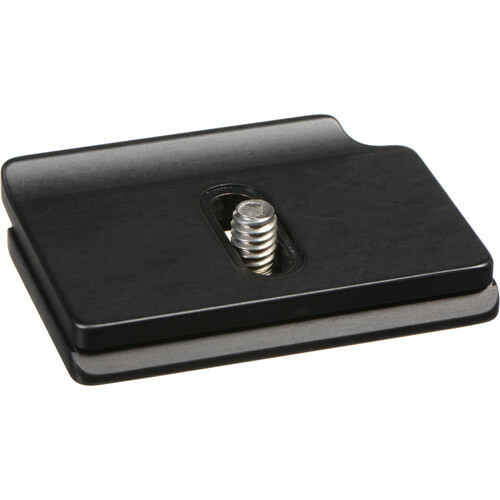 Box Dimensions (LxWxH) 3.4 x 2.0 x 0.5"
Arca-Type Quick Release Plate for Canon 7D is rated 4.7 out of 5 by 6. Rated 4 out of 5 by WillyBFriendly from As expected... Conforms well to the contours of the camera. It mayt be a bit wide, interfering with the extension terminal (for wireless adapter) but since I have not used that port, I can't say for sure. Why these little pieces of machined aluminum are so spend will always bewilder me. Rated 5 out of 5 by Jacob from Solid and Perfect Wish these things didn't cost so much, but well worth it. I use this to move my 7D between a QR plate on my BlackRapid strap and my Benro head. Worth the extra coin for the ease of use. Solid, and the anti-twist works great. Get this instead of the Kirk, which is $ more. Rated 5 out of 5 by Anonymous from does the trick The plate does what is advertised - it fits tightly under the camera (7D). Looks robust and I expect many years of service. Rated 4 out of 5 by Richard from Works well Provides good fit, although I'm not sure it is substantially better than the generic plate. Rated 5 out of 5 by goemon from Solid QR Plate Good, solid fit for my Canon 7D. will the Acratech Quick Release Plate No. 2177 fit the Canon 7D mkII ? Unfortunately, there are small physical dimension differences between the Canon EOS 7D and Canon EOS 7D Mark II DSLR camera that would not let the Acratech Arca-Type Quick Release Plate for Canon 7D be fully compatible with the 7D Mark II DSLR camera. Arcatech's website lists the Acratech Arca-Type Quick Release Plate for Canon 6D, B&amp;H # ACCP6D (MFR# 2185), as the correct plate for use on the Canon EOS 7D Mark II DSLR camera.